So since I’ve not worked in an office for years I am out of touch so if none of this is work appropriate please feel free to sound off in the comments below, actually I encourage you to do so, I love your comments! So essentially what I’ve done is put together a few trends I’m loving right now that I think would work for workwear . . that sounded weird, and then done a couple of examples of workwear outfit ideas incorporating the trends. 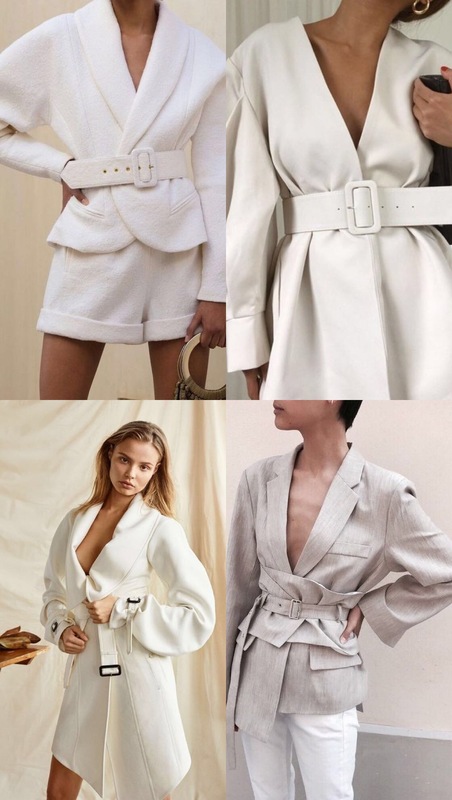 So looking at workwear as a whole and tailoring which I guess is the main part of workwear I’d be looking to stick with a neutral colour palette and play with the silhouettes and proportions. Think power dressing with clean lines and minimal pieces massively oversized. At the bottom of each idea I’ve also done a little edit of what’s online right now so just click on the pictures to shop! Double trouble, candy suits are always popular on the streets so I say wear them to work but stick to neutral colour tones. Belt the blazer to add an edge, go with oversized blazers and flared trousers for a more fashunnnn approach. Play with fabrics, think silky, linen or wool. Click on the images below to shop the items! Statement trousers can be paired with legit anything to make it look fashionable and still work appropriate. I recommend adding a pointed toe to keep it clean then on top add a blazer, a knit, a slogan tee. Celine’s oversized belt makes any plain trousers statement and I’m sure the high street will have their own version within the month. @Lornaluxe is the girl to go to for work appropriate fashion shoes. Kitten heels with a point are the perfect fashion work shoe and will make anything look smart. 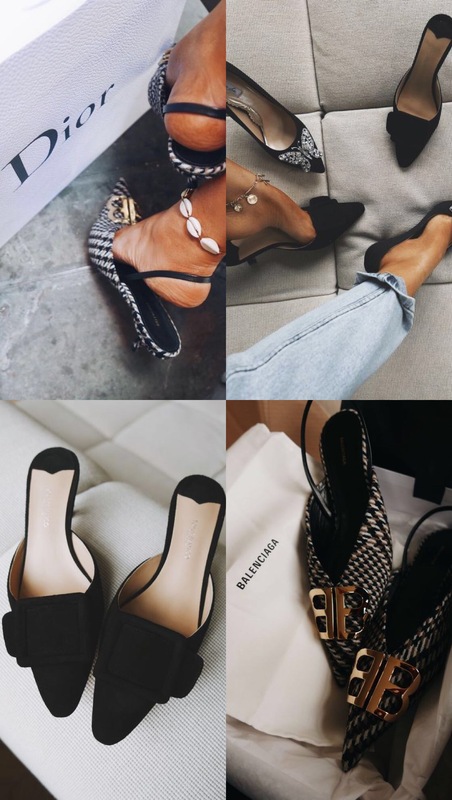 Balenciaga are the ultimate go to pair but there’s some pretty great high street alternatives all linked. Add these to any of your workwear outfit ideas and you’re good to go. Blazers are always in for workwear but they’re having a moment in fashion right now. Blazer dresses are everywhere right now, alternatively belt your blazer and add some skinny trousers or a matching skirt. 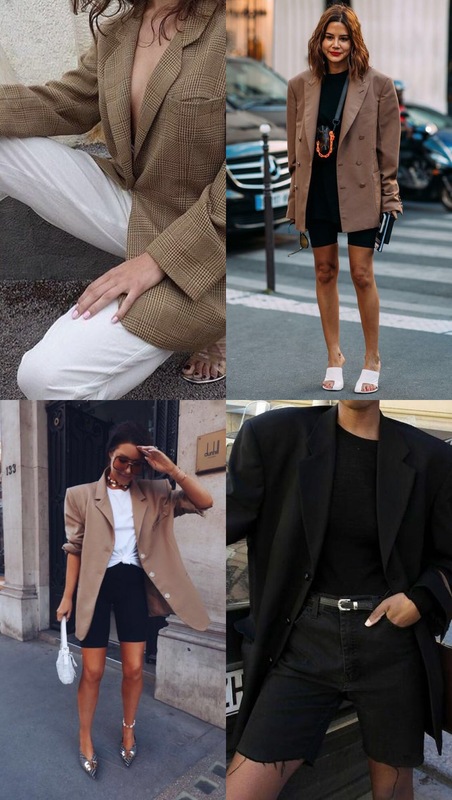 Oversized camel blazers are super popular worn in fashion with cycling shorts or skinny jeans, switch out for tailored black trousers or a pencil skirt for work. Think houndstooth, camel or white in stiff wool or flowing materials with the sleeves bunched up. The classic workwear item only with a twist. 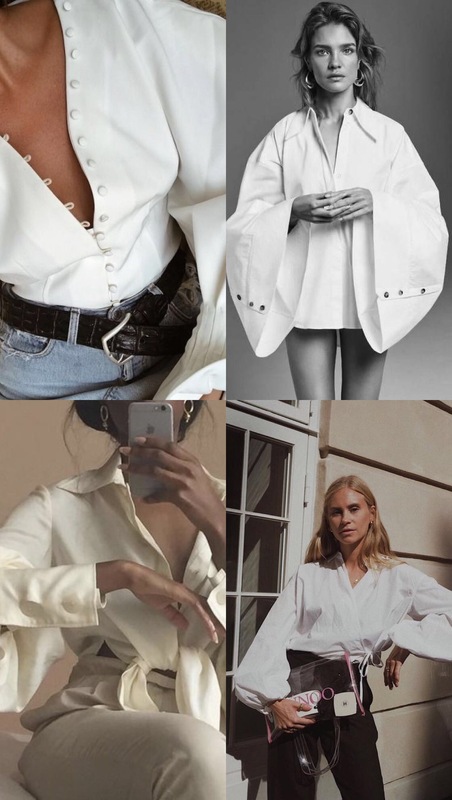 Take a classic shirt in 3 sizes up and wrap it over or pick a style with statement details like a puff sleeve or corseted waist. Wear with literally anything. 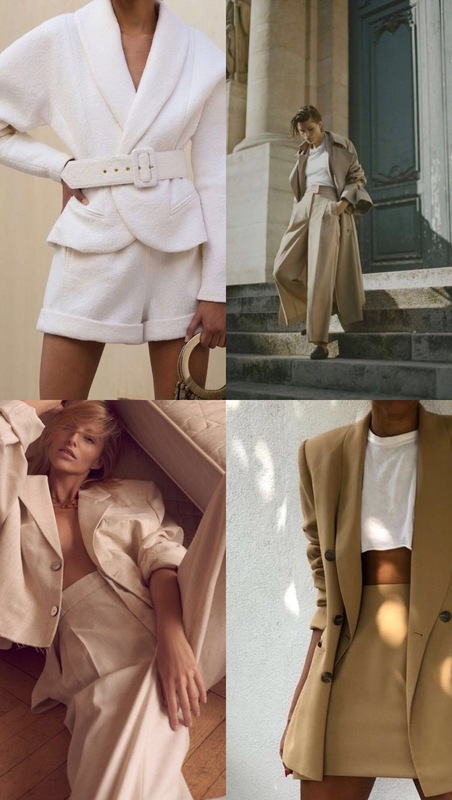 OK so you’ve seen my inspo courtesy of Pinterest and now I’m going to do some workwear outfit ideas with the pieces I picked out! Leave me a comment with your favourite look. I think mine might be look number 4. These trousers are incredible and those shoes might have to be added to my basket. A good shoes and bag combo can legit make any outfit feel more luxe and fashionable. These shoes from The Row are not only work appropriate but would also look insane with jeans and a knit or a fancy dress. They’ll do you for any occasion. I don’t think you should have to sacrifice being comfy just because you’re at work. Wear this cosy knit with a pair of tailored trousers in the print of the season and dress it up with the accessories. Taking the oversized blazer trend into workwear with a pair of faux leather trousers, my personal favourite for a winter wardrobe. The printed Balenciaga shoes add the final touch and the statement white shirt means you look chic even when you’re blazers on the back of your chair. Plus let’s just take a moment for this £9.99 high street alternative to the Celine necklace. Going in for the suit and keeping it tonal. Wear the blazer a size too big and belt. I love the tan Gucci belt and think it’s the perfect finishing touch to make a plain outfit more interesting. Keep the rest of the outfit simple with some white heels and a classic bag. This time we’re focusing on tailoring. 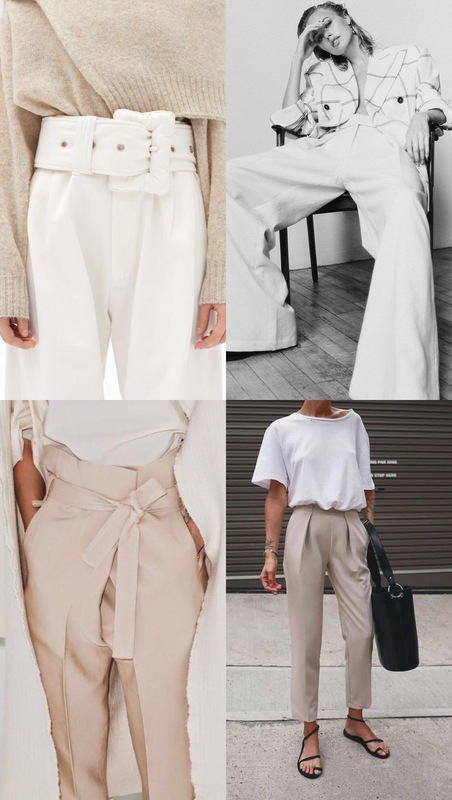 The oversized trousers are the show stoppers paired with a simple white shirt with puff shoulder detail and some killer points that will look amazing poking out of the flared bottoms. Hi! For someone who knows nothing about workwear, you did an awesome job on this post!! Love all of these looks. They are exactly what I wear to my office! I find this topic really interesting. I’ve always loved workwear outfits! I think a white blazer paired with camel trousers are a passepartout, especially in this time of the year!